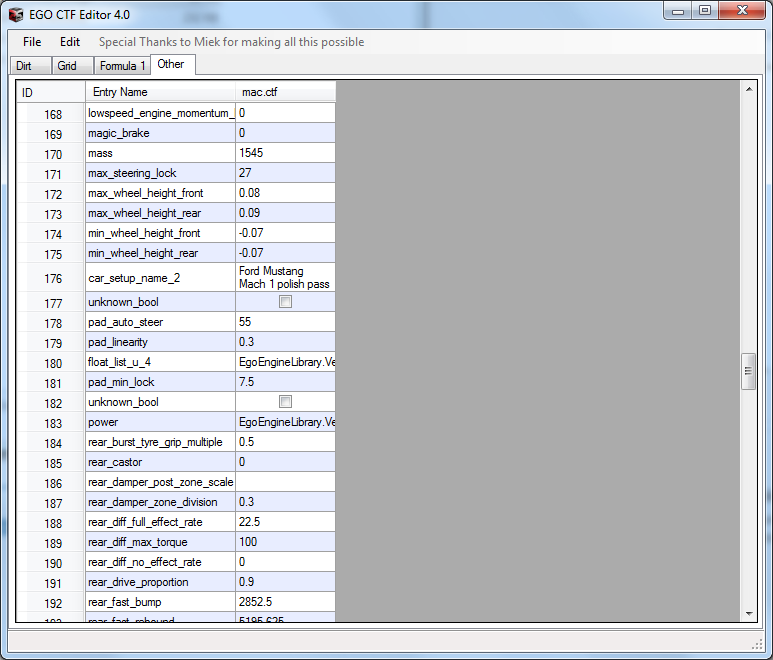 With this program you can edit CarTuningFiles (CTF,CSV) files for the EGO engine games. These files contain car performance data. Intuitive GUI -- The graphics user interface has been built to allow maximum ease of use when editing files. Easy Compare -- Aside from the files' data being lined up side by side, with the click of a button the program will show you all the differences between the files. Community Involvement -- Schema files for each game are in xml format so that modders can edit descriptions of their findings for the file's values and share them with each other. Open With -- Allows you to choose "Open With" and select this program to open CTF files. After turning on the program, simply select a game by pressing the appropriate tab, and then click File -> Open and select a CTF file to edit. 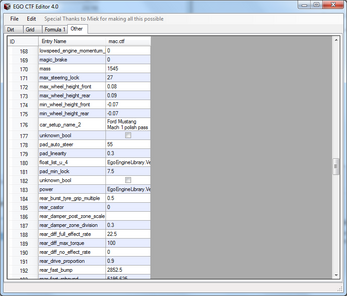 Each new file is loaded into a column in the datagrid. Press on the column's header to select a file before saving or closing it. Pressing on the first column's header will open up a filter box for you to search entry names. Middle (Scroll) click a cell in any row to highlight it for better viewing. Use Control-C to copy and Control-V to paste data. Drag and Drop a file on the form to open it. Miek - For figuring out the schemas for the files which make all of this possible. luh-koala - For creating program icon.